Winter can be a tough time to survive in the wilderness. Not only will you initially face the dangers of hypothermia, but forests will seem to be completely barren and devoid of any source of food. In all cases, they will be full of vital energy for your survival. But they aren’t peanuts; there is a bit of technique to processing them if you don’t want to get sick, but it’s well worth it. 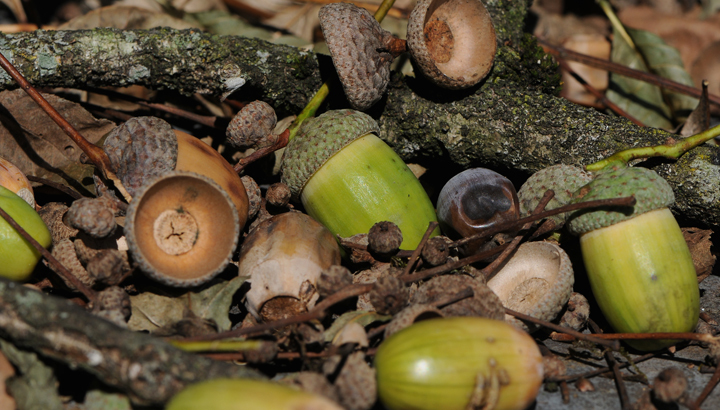 Here is an overview of what to do if you need to consume acorns in the wild. First off, you need to find the acorns, which shouldn’t be too hard if you are in an area with oaks. Gather as many as you can. You don’t need to be too picky at this point, you can discard the less desirable ones later or use them as bait for squirrels. When you do get back to camp and are separating the good from the bad, look for acorns that have holes, are discolored from rotting, and have roots that are longer than an inch. All of these should be in the discard pile. Find a flat stone to lay the good acorns on, and a stone to use as a hammer to crack them open. If you are having trouble cracking them without losing some of the meat, try laying them in a bandana and folding it over them before striking them. If you have a container that you can boil water in you will be able to eat your acorns quicker. Some can be eaten raw, and it’s worth a try to save the time and energy. If they taste bitter make your tongue feel like a piece of felt, they have too much tannin in them to be eaten raw. Place them in the container with water and boil the water, replace with fresh water until the water is no longer discolored. If you don’t have a container you can place them in a bag or bound in cloth and soak them in a stream, but this could take days. There’s a reason why squirrels pack trees full of these little things! Don’t pass acorns up if you are looking for food in the wild. How Necessary is an EDC Kit?